Add everything into a blender and blend everything until frothy. It will be hot so make sure to be extra careful when removing the lid. Make sure to open it away from you. Add a little sweetener if you feed the tasted a little bitter - and you’re Instagram ready! Continuing with our interview with Kyra Ann (IG:kyrholistics) from last week, down below she shares where she gets her inspiration, favor Instagrammers and smoothie. Where do you get recipe inspiration? Definitely from Instagram. There are so many talented and intelligent women out there that have inspired me to be a better and healthier eater. Every day I gain inspiration from the creations of others and often will try their recipes or will spin off and make my own! I love making a huge, thick, packed veggie smoothie. I enjoy putting so many micro nutrients into one meal and having it taste almost like dessert. It’s pure bliss. I love taking a warm bath with essential oils diffusing and soft music playing. Then, after my bath I do some dry brushing, coconut oil on my skin, and relax with my Himalayan salt lamp on and a good book. I always feel so energized & ready for anything afterward. Where do you go food shopping? I have a creepy love for grocery shopping and find excuses to go at least twice a week. I usually just go to my local Smiths Marketplace (Kroger) because they are affordable and have tons of organic options. I buy supplements and anything I can’t find there at my local health food store Good Earth. My favorite is if I can find my produce at a local farmers market! Definitely loving that this summer. Who is (are) your favorite Food Instagrammers that you follow? One of the first foodies I started following on instagram was Blair, @balancewithb. I have learned so much from her and I still refer to her blog often for recipes. The other instagram & podcast that really helped me was Jesse and Marni from @theultimatehealthpodcast. I have so many beautiful friends I’ve met in the health world that I follow regularly know I don’t think I could even narrow them down! What is a big food/health trend that you’re currently into? Eating more of a grain free diet. It happens to be a trend but actually really works for my body because of my specific sensitivities. Add kale to a large mixing bowl with lemon juice and1/2 Tbsp olive oil. Use your hands to massage the kale and break down its texture a bit. Once done, place on serving plat. To the kale add sliced tomato, cucumber, avocado and hemp seeds. This salad makes an excellent side dish to meals like veggie burgers, and pizza. You always add your protein of choice to make it a more substantial entree. Best when fresh. Store leftovers in the refrigerator for up to a few days. What the heck is Matcha tea? Matcha, matcha, matcha, lately Matcha tea is all the craze among health and wellness bloggers. It seem like you can't check your instangram accounts lately without seeing the bright green color of matcha-infused lattes, cakes, and smoothies. For tea lover like myself, it's great!! there is nothing like a good health trend that doesn't involve starving yourself or depriving yourself in hope of losing weight. Put simply, the world has gone bonkers for matcha, from matcha latte, smoothie, brownies, energy balls to cake. Unless unless you've been living under a rock, you've definitely noticed this new craze. I am proud to say that I am a part of this matcha cult. For this post I thought I'd give you guys a little breakdown to what is matcha green tea, and how I make my morning matcha latte. Let’s start with the basics, what is matcha tea? matcha green tea is delicate tea leaf variety typically grown and processed in Japan. Matcha tea is typically used in Japanese tea ceremonies. The green tea are often shaded from the sun for few weeks of their growth, which help increasing the chlorophyll content and creating a gorgeous green color. Then, the leaves are carefully ground with stone grinding wheels to produce a fine powder. The powder can then be used to brew an antioxidant rich frothy green tea or in recipes like smoothies or baking. Combine milk, matcha, collegan, coconut butter, honey and moringa powder (optional) in a small in blender. Blend until smooth and creamy. Once it's done, set it aside. While the matcha is blending make sure to boil a cup of water in a kettle. Pour the matcha into a mug and add your boiled water. Serve immediately and enjoy!!! 1. Start by placing the pruns, almond butter, honey, coconut butter, and milk/water in a blender or food processor. Process the pruns until small pieces forms and they're sticky. Empty into a bowl and set aside. 3. In food processor blend/process the rest of the ingredients, coconut oil, walnuts, cinnamon, chia seeds, quinoa, hemp seeds, collegen powder, cinnamon, and nutmeg. 4. A mixing bowl, add the mixed pruns, dark chocolate and coconut oil, walnuts, cinnamon, chia seeds, quinoa, hemp seeds, collegen powder, cinnamon, and nutmeg. Using your hand to mix everything together, and make sure that it's sticky or you're able to form a ball. Add a little of honey to make it easy to make the balls. 5. Scoop out round tablespoon amounts and using your hands to roll into little balls in the palms of your hands. Then rolled into matcha powder, enjoy immediately orstore in the fridgefor 3-4 hours or overnight. Bite and enjoy! just try not to eat them all at once! What can I say, if you've read the previous post you probably know about my obsession and love for salad bowl. I can talk forever about salad bowl, but the more I do it I becoming to recognize that perhaps strong inclination toward it is attributed to the simplicity of the dish. It is the ultimate minimalist's dish because it's simple and there is no clutter with it, the ingredients are simple, and natural. I was in need of a quick lunch today that took less then 30 minutes, so I decided to make another salad bowl. By far this is probably one of my favorite salad bowl recipe I've developed - this is so addictive and SO easy to make too. The funny part I accidentally put cinnamon in the chickpeas thinking it was cumin, and I must say, it was a great mistake because it made the dish just taste some much better, the balance between the spices (cinnamon, cumin, turmeric, and Pataks - madras curry past), made the flavor and texture of the dish ten times better. 1. Heat 1 tsp coconut in a cooking, add wash/rinsed chickpeas , and season with turmeric, cinnamon, and cumin. Let it cook for 5 minutes. Add 2 tsp of madras curry past, and let it cook for another five minutes. Set it aside. 3. Add chickpeas to the green bowl and serve warm. It should make a serving of one, but you can always modify to fit the number of people. Preheat oven to 375°F. and line a baking sheet with aluminum foil. Cut the squash in half and scoop out the seeds. Place diced squash on the baking sheet and brush lightly with olive oil, sprinkle with salt, turmeric, cumin and curry, bake for 40-50 minutes or until the squash is tender. Remove from Oven and let it cool off. While the squash is baking or cooling off in a large cooking pot heat the oil over medium high heat, mix in onion season with cumin, turmeric and curry. Let it cook for about 10-20 minutes until the onion is tender or golden brown. Oil baking sheet. Place squash, cut side down, on baking sheet. Bake until squash is very soft, about 50 minutes. Using paring knife, remove peel from squash; discard peel. Cut squash into 2-inch pieces. Heat oil in heavy large pot over medium-low heat. Mix in onion, brown sugar, ginger, garlic and cinnamon. Cover pot and cook until onion is tender, about 15 minutes. Add squash and 5 cups chicken broth. Bring to boil. Reduce heat to medium-low. Cover and simmer 10 minutes. Discard cinnamon. Working in batches, purée soup in blender. (Can be prepared 1 day ahead. Cool slightly. Cover and refrigerate.) Return soup to pot. Season soup with salt and pepper. Bring to simmer, thinning soup with more broth if necessary. Ladle into bowls. Sprinkle with parsley and serve. There is something about reading a GOOD book and having to think and analyze certain points or even a simple quote in the book. I am currently on my way to finishing John Steinbeck’s East of Eden, and this morning I was once again awed by the beauty of his writing. The First book I read of Steinbeck was Of Mice and Men, while it was five or six years ago I can still remember certain quotes in the book and still find myself awed at his writing. While I was writing this morning I was embraced by this beautiful quote which I think a lot of us forget sometimes, the fact that we always have a choice; the notion of free choice over evil, a symbolic of optimism that is central to the human condition that we overlook by rendering ourselves as being powerless or lacking a choice. This quote made my morning and probably my day; we always have a choice regardless of where you are in life you always have a choice, the choice to do evil or to do good. As Hannah Arendt once wrote no one is completely powerless, which is another central aspect of the human condition, we are never powerless regardless of how powerless or out of control we sometimes feel. In a large pot add water, oil and salt. Bring it to boil, add pasta. Cook until pasta is al dente. 20-25 minutes. In a skillet over medium hear warm 1 tbs olive oil, addd onions, and garlic powder, let it cook for 20 minutes. Stir onion evert now and then for, add little of red wine and water. Let it cook until blonde in colour. Set it aside. In another skillet over medium heat add 1 tbs olive oil, add Brussels Sprouts season with salt, pepper, rosemary, and garlic powder. Let it cook for 20 - 25 minutes until golden brown. Once done set it aside. In another skillet, add olive oil, when hot add baby spinach, garlic powder, salt and pepper. Sauté spinach until wilted, about 6 minutes. Inspired by dinner at (Pure Kitchen), I had a chance today to create my first vegetarian bowl; inspire by their creation of the warrior bowl. I am fascinated by meal bowls, there is something beautiful and eye catching about bowl meals, big, bountiful bowls are all the rage and it's easy to see why. A simple bowl meal is a creation of beauty and art in itself that catches the attention of everyone. A bowl is arrangement go veggies, and proteins (grains, noodles, quinoa, chickpeas etc....). It is beautiful creation that is made of everything,a little of this and little of that. Quinoa: Add quinoa and water to a medium sauce pan. Bring the mixture to a boil reduce heat and simmer for 10-15 minutes or until the quinoa is translucent and tender. Drain off excess water and transfer to a bowl. Add salt, olive oil and pepper toss to coat. Refrigerate in an airtight contain until ready to use. Kale Omelette: In a bowl beat the two organic eggs and stir in the kale, salt and pepper. In a small skillet coated with cooking spray over medium heat cook the eggs mixture for about 3-4 minutes. Flip with a spatula and continue cooking 3-4 minutes. Reduce heat to low and connote cooking for 3-4 minutes or until desired doneness. Dressing: In a small bowl add vinegar, olive oil, turmeric pepper, salt, lime, cumin, chill powder black mustard seeds, ground yellow mustard seeds and sesame seeds. Mix until the density of the dressing is thick. Place in airtight container and refrigerate it. 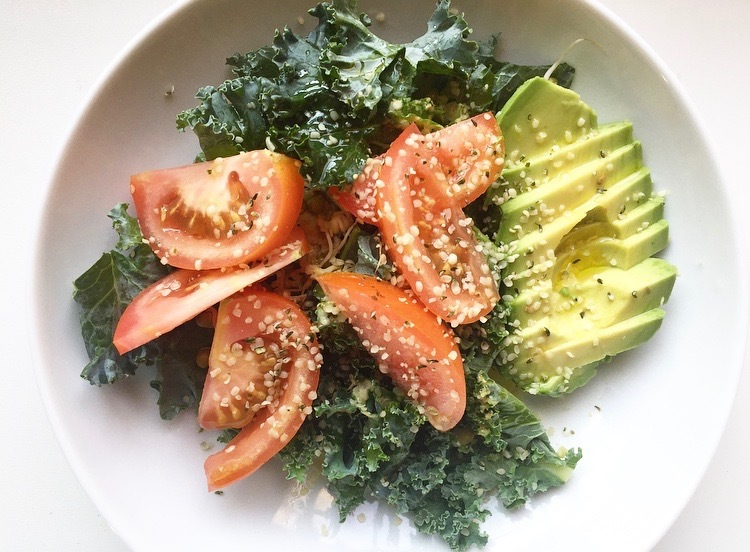 Leafy greens/kale salad: Chop tomatos to desire shape, kale and avocado. Add olive oil and salt toss to coat. Assemble the Bowl: In a simple white bowl or airtight container add in some quinoa, omelette egg, kale salad, avocado and almond. Garnish with black pepper, salt and a french spritz of lime juice.